Atlanta, GA, July 9, 2018: Vibha Cricket, started in 1999, recently completed twenty years. The reasons for this stupendous feat can be many. The compelling cause of underprivileged children, the uninhibited spirit of the volunteers of Vibha, the absolute love for the game of cricket – or a perfect mixture of all the three. “We take great pride in the fact that it was Vibha that introduced and promoted the hard-tennis ball cricket in Atlanta. We tapped into the passion of cricket as a vehicle to make a difference in the lives of children. In these 20 years, in addition to raising more than $750,000 in direct fund-raising, this tournament brought together dedicated volunteers and committed corporate sponsors to all other fundraising events of Vibha,” said Srinivas Vemulapalli, a volunteer of Vibha who had played a significant role in organizing all these tournaments since inception. The Chief Guest for the event, Ricardo Powell who played for West Indies in International Cricket and currently the Chairman of the USA Cricket Selection Panel, made a special mention of the promotion of women cricket by Vibha and hoped that this would serve the critical need for more women cricketers for Team USA. The twentieth edition of the tournament saw a renewed commitment and excitement for the cause from all the players. All the teams took pride in fundraising through social media for their respective teams and with matching donations from generous sponsors, a total of $150,000 was raised for this event. The best fundraising teams – Cool Guys, who raised close to $12,000, and Pitch Perfect, a new women’s team that raised $6500 – were specially recognized. The President and CEO of FutureTech, Sravan Vellanki, who has taken a keen interest in the growth of Cricket in Atlanta and a force behind the success of this tournament over the years said, “No one has ever become poor by giving. I am proud of all the cricketing families in Atlanta for their generous donations and making a tremendous difference. We are glad to be in association with Vibha for the past two decades. It made me a better person and FutureTech a more socially responsible company”. The tournament, played over three successive Saturdays started on April 21 with 42 Men teams and 11 Women teams. The excitement of Vibha cricket – the last ball finishes, Super-overs, and close calls – continued all through the tournament. The Men Semi-final match between Marietta Mayhem and The Atlanta Hand Specialist Blazers was the highlight of the tournament. Blazers set a modest target of 63 runs and defended it in a dramatic over by the Best Bowler of the Tournament Rajshankar Lakshminarayanan in which three wickets were taken, one on the last ball after conceding a sixer in the penultimate ball. 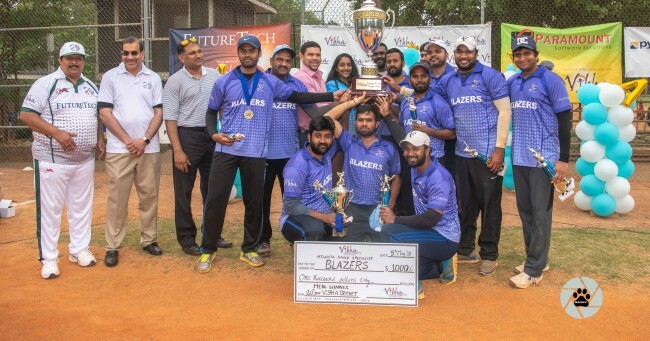 After winning the game in the super over, Blazers won the finals easily by setting a huge total of 89 runs, powered by 44 runs from the Man of the Match Divakar Mayakrishnan, and getting the Monster Kings out for 65 runs. Gaurav Ahuja of Marietta Mayhem was awarded the Best Batsman of the tournament. Srinivas Vegi of the Monster Kings was awarded the Man of the Tournament for his overall performance with the bat and the ball. The Women’s Tournament saw tremendous spirit of competition on the field, with four new teams joining seven from last year. 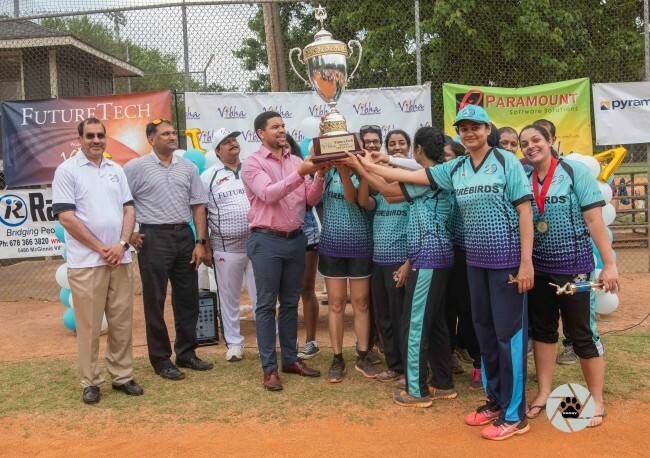 While there was enough resistance by teams like Chak De, the returning champions Firebirds, led by Gurpreet Kaur, and the 2016 champions ATL Strikers, led by Padma Padala, reached the finals. In the final match, Firebirds continued their dominance with the bat, led by the Woman of the Finals Anuradha Sundar and Patricia Salles, in setting a huge target of 72 runs in 10 overs and restricted ATL Strikers to 50 runs to regain the title and lift the newly minted rolling trophy for Women Championship. For their overall performance in the tournament, Padma Padala was declared the Woman of the tournament, Anitha Shanmugam as the Best Bowler, Jasmine Patankar as Best Batswoman. The Fair Play awards were given to the women team Supernova and the men team United CC. Sanjay Narla, who has played this tournament for the past 18 years and led huge contingent of players under the Monsters banner and winning several times over the years, took up role of the organizer this year along with Srinivasa Duddempudi. Narla called his experience humbling and said this is the best group of volunteers to be associated with for a great cause. Moving on from one tradition to another, and with renewed commitment from the tremendous success of Vibha Vibe and Vibha Cricket, volunteers are gearing up to the DreamMile, which will also be in its 20th year, to be held on the September 15. Another tradition-in-the-making event called “Are you Ready for College?” is being planned for Middle and High school student on August 12.